The coach and bus dedicated satellite navigation range comprises of five different models, each model is preloaded with UK and Europe maps - this enables continental drivers to plan their trip door to door right across both Eastern and Western Europe. What's more the Snooper coach and bus range can be programmed with up to 7 different routes and up to 16 different stops along each route too. This is an extremely useful feature, especially if you offer short trips, day trips or excursions and have mulitple stops. 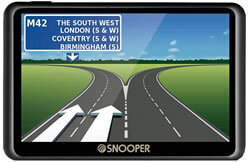 You can simply enter in all of the stops (up to a maximum of 16) and the Snooper sat nav will not only provide the time and distance to the final destination, but the time/distance to your next stop too. 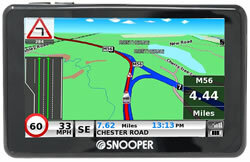 Furthermore, you can enter your buses or coaches dimensions - height, width, weight into the Snooper coach and bus sat nav so you will only be directed along suitable roads, saving both time and money. For further help on deciding the best coach and bus sat nav to buy for your needs, the needs of your business or maybe as a gift for somebody else, see either our comparison table or phone 01733 777623 (Mon-Fri 9:30am-5pm) outside of these hours please contact us online. 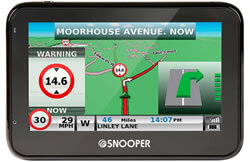 Snooper pioneered the first dedicated truck sat nav in 2007, a few years later followed the Ventura range, dedicated to motorhome and caravan enthusiasts. 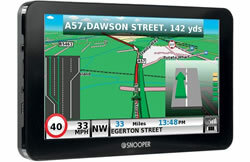 Now they have launched the first dedicated sat nav for drivers of coaches and buses. 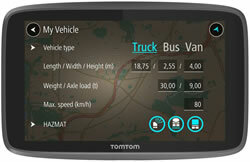 TomTom have also launched bus and coach satnavs which is the TomTom GO PROFESSIONAL 620. These systems include 6-inch touchscreens and you can enter you vehicles dimensions to be routed along appropriate roads. WiFi connectivity also features allowing the download of mapping and software without Connecting to a computer.